Text: “Monkey Theater” – to the adult ear, this name has something grotesque about it. Such was not the case when I first heard it. I was still quite young. That monkeys must have looked rather strange onstage was a consideration wholly overshadowed by this strangest of all things: the stage itself. The word “theater” pierced me through the heart like a trumpet blast. My imagination took off. But the trail it pursued was not that which led behind the scenes and which later guided the boy: rather, my imagination sought the trace of those clever, happy souls who had obtained permission from their parents to spend an afternoon in the theater. The entry led through a gap in time – that uncovered niche in the day which was the afternoon, and which already breathed an odor of the lamp and of bedtime. On entered not in order to feast one’s eyes on William Tell or Sleeping Beauty – at least, not only for this reason. There was a higher goal: to occupy a seat in the theater, among all the other people who were there. I did not know what awaited me, but looking on as a spectator certainly seemed to me only part of – indeed, the prelude to – a far more significant activity, one that I would engage in along with everyone else there. What sort of activity it was supposed to be I did not know. Assuredly it concerned the monkeys just as much as it would the most experienced theatrical troupe. And the distance separating monkey from man was no greater than that separating man from actor. Comments: Walter Benjamin (1892-1940) was a German philosopher, essayist and cultural commentator. His idiosyncratic memoir of observational pieces on his Berlin childhood was not published in collected form in his lifetime, and not until 1989 in a form that most closely matches the author’s intentions. Text: The other places of entertainment open to the workman are the theatres and the music-halls. In the two music-halls in the town, which are always full, the dearest places – excepting the boxes, in which, apparently, only a select public go – are 1s., the price of the orchestra stalls. The dress circle is 6d., the pit 4d., the gallery 2d. In the gallery there are always a great number of boys, as well as in the pit. The front row of the gallery generally consists of small children, little boys between seven and ten, eagerly following every detail of the entertainment. Each of them there must have paid 2d. for his place – how he acquired it who can tell? probably either by begging or by playing pitch and toss in the street. There are workmen to be seen in the orchestra stalls; that means 1s. a night. If a man takes his wife with him that means 2s. : but there many more men than women to be seen there. Women go oftener to the cheaper places: one may see a ‘queue’ of them waiting to go to the 2d. seats, often with their husbands accompanying them. Many of these women have their babies in their arms. There is no doubt that they come out looking pleased and brightened up. The kind of entertainment usually offered does not, to the more critical onlooker, seem either particularly harmful nor specially ennobling. The curious fact that, in almost any social circle, it makes people laugh convulsively to see anyone tumble down, is kept well in view and utilized to frequent effect. As to the theatre, the stage in such a community we are describing – or, indeed, in any other – has immense opportunity. The stage is at once the eternal story-teller and the eternal picture-book. The repertory of the two theatres in the town, fortunately, does not consist only of reproductions of London successes of the most trivial kind. These are occasionally performed, but more often the plays are sensational pieces of a melodramatic kind – that is, usually sound and often interesting plays, in which the boundary of what is commonly called vice and virtue is clearly marked – virtue leading to success and happiness, vice to a fate which is a terrible warning. For my part, I wish that such representations, such pieces as these, could be multiplied, that they could be constantly accessible at entirely cheap prices for the ironworkers and their families – indeed, for the whole of the population. I would like to see some building of the simplest kind in every parish in which they could be performed. There is a small town a few miles distant from Middlesbrough to which there comes at intervals a stock theatrical company, which performs literally in a barn, at infinitesimal prices The plays produced, if not very nourishing to the more complex mind, are always sound and good, full of movement, full of interest to the audience before whom they are performed. Night after night that barn is full; night after night men and women, boys and girls, who might be loitering in the streets or in public-houses, are imbibing plain and obvious maxims of desirable conduct, are associating mean, cowardly, and criminal acts with pitiable results. No one who had been to that little theatre could doubt the good effect of the influence that must be radiating from it, and it would be well if such centres of influence could be found in every manufacturing town. There are, no doubt, many people, and some of these are to be found among the working class, who disapprove of this medium of entertainment. But there are also many of us passionately convinced that the stage, if used in this way, would be an influence more for good than for evil; that it would offer countless opportunities of suggesting a wholesome, simple, rough-and-ready code to many listeners who since they left school have probably not had any moral training at all, and the majority of whom are more than likely to drift along through their lives at the mercy of every passing influence. Comments: Lady Bell (Dame Florence Eveleen Eleanore Bell) (1851-1930) was a British aristocrat, playwright and author of At the Works, a study of working lives in Middlesbrough, North Yorkshire in the 1900s. The two music halls in Middlesbrough at this time were the Empire Theatre of Varieties and the Oxford Palace of Varieties. Text: Why should the function of the playhouse critic be confined exclusively to the players? Why should the Aristarchus of the stalls for ever project his eagle glance behind the footlights? Why should he take heed only of the mimic life enacted upon the stage, while humanity itself as it exists behind and around him, affording a definite standard by which the imitation may be judged, is all unnoticed in his oracular verdicts? There should be a critic for the public, as well as for the players. The behaviour of the audience, the degree of intelligence exhibited in their demeanour, and the interest they take in the performance, is quite as susceptible of judicial analysis as the deportment of the actors and actresses. There is as much matter for attentive consideration in the composition of the spectators, as in the cast of a play; there is as much of edification to be derived from studying their manners and character, as from the critical contemplation of eminent tragedians and accomplished artists in comedy-drama. Theatrical audiences, moreover, have their idiosyncrasies, just as much as theatrical companies. The purely society, or orthodox fashionable audience; the fast fashionable audience; the domestic audience; the respectable audience; the mixed audience; the working-class audience; these are only some of the varieties which may be enumerated. The last-mentioned, the working-class audience, is itself capable of sundry subdivisions — the transpontine, the extreme East-end, the flash, the decorous, the criminal, the honest, the drunken, the sober. Only a few of these can be glanced at now, but few though these may be, they will be sufficient, if taken in connection with an article that appeared more than a quarter of a century ago in the weekly journal from which ALL THE YEAR ROUND sprang, to give some idea of the width and fruitfulness of this new field of dramatic criticism. The purely society audience is not to be confounded with that chiefly characterised by the ubiquitous presence of amateur critics, of the tooth-pick school. The ultra-fashionable differ wholly from the fast fashionable houses. The tooth-pick critics come late, and enter somewhat noisily; when society goes to the play, it comports itself with frigid tranquillity, and in consideration of the hour at which the performance is fixed — eight P.M. — takes its seat with astounding punctuality. Society affects social comedies, sparkling with what it likes to speak of and consider epigrams, but what are in reality quaint and smart verbal antitheses and contrasts; the fast fashionable audience tolerates the drama pure and simple, but never really enjoys itself, save when burlesque is on the boards. If the society audience is to be observed in its perfection, it is to Tottenham-street or Sloane-square that one should go. At the Thespian temple reared in either locality, the wants and wishes of society are considered and supplied with the tenderest solicitude, and society is good enough in return to be pretty constant in its patronage, and to be seated ns soon as, or very shortly after, the curtain rises. The degree of attention with which the performance is watched varies. Society is not demonstrative; it seldom applauds; it frequently accompanies the dialogue of the drama with a monotonous undertone of well-bred chatter, the general effect of which is rather that of a low and barely audible murmur, than of articulate sounds. Society is not moved to laughter or to pity. It occasionally smiles at the sparkling repartees which are so much in fashion; it seldom fails to smile when the situation placed before it on the stage is intended by the dramatist to appeal with exceptional strength to its tenderer sentiments. At times, a look of puzzled surprise at the weaker feelings of humanity, as depicted by actors or actresses, plays over society’s countenance. Bat, for the most part, its face is as passionless and undecipherable as the Sphinx. Altogether it is not an audience which inspires, save so far as a consciousness of its selectness can inspire, the actor; neither on the other hand does it discourage or disturb. The audience in which the toothpick element is largely represented cares but little for comedy-dramas, and is insatiable of extravaganza and burlesque. As a concession to public usage, the burlesque of the evening is generally preceded by something in the form of a play—comic, farcical, melodramatic, or tragic. But it is not till nine or ten that the patrons, for whom the management chiefly caters, appear upon the spot. Whether they occupy private boxes or stalls, they are readily distinguishable. The amplitude of shirt-front and wristband, the strident tones, the echoing laugh, proclaim at once the tooth-pick critic. Some of these gentlemen are up from Aldershott bent on a metropolitan holiday; others are scions of, or it may be are, themselves, hereditary legislators; others again are baronets, guardsmen, and their hangers-on; others — and these perhaps constitute the majority — are gentlemen whose days are given to commercial pursuits in the City, and whose evenings are devoted to enjoyment at the West-end. Their devotion to the drama, so far as it goes, is beyond Suspicion; and if once an extravaganza or burlesque has won their favour, it is surprising how long that favour lasts. Their manners have not that reserve which signalise the purely society audience. They are demonstrative, and even turbulent. Their critical comments in the stalls, which are mostly of a strikingly personal nature, are made in a tone so loud that the actors and actresses can overhear. But whatever their demerits they are staunch and liberal cultivators of the dramatic art, and with- out their support the assistance of society alone would be insufficient for the material prosperity of the stage. The audience which patronises the theatrical matinée presents various features, which are distinctively and peculiarly its own. It combines many of the attributes of what would be loosely styled Bohemianism with those of most orthodox respectability. It is conspicuous for the blending of the professional and theatrical element with the decorous suburban — for the meeting of the ladies and gentlemen of “the profession” and the denizens of Clapham, Sydenham, Hampstead, Highgate, as well as of quarters considerably more remote, upon common ground. Be the occasion one of those benefits which have been witnessed on a remarkable scale in the course of the last two or three months, or the afternoon performance of a farce which is for a while the talk of the town, or the appearance of some Gallic histrio of note, you shall observe unmistakable specimens of these and other classes of playgoers congregated in the auditorium. The lady to whom you sit next in the stalls is the most finished and artistic of living actresses in comedy-drama; on your right, with dishevelled locks and keenly-piercing eyes, is an eminent tragedian; just before you a highly promising jeune premier, the scion of a famous house, who “would be an actor;” just behind you the protagonist in a drama of domestic life, who from the unparalleled success achieved by the play seems likely to figure in the same rôle incessantly to the end of his natural days. There, too, are the invalids of both sexes, who love the stage, but to whom the night air is the deadliest of foes; those also, who inform you that they should patronise the drama more frequently than they do were not the hours of the performance such that they interfere with the consumption of their dinner or their night’s rest; those again, already mentioned, who live outside the metropolitan radius, but who have objections to the dissipation and the late hours involved in theatre trains; those, lastly, who inform you that they never go to theatres on principle, but they occasionally make an exception in favour of afternoon performances. This final class is a numerous one, and is almost coextensive with that which sees no harm in the “entertainment” but a great deal of harm in the play. An expedition to the Thespian shrine by gaslight is an abomination to be eschewed; but though when the portal of the theatre be once passed gas is still the illuminating medium employed, the theatrical visit has an innocence which it could not possess if undertaken at the hour when Melrose should be viewed aright. Thus it is that the theatrical audience which affects the matinee is a motley composition of parsons and players, severely devout spinsters, superior men, and strong-minded women, lovers of pleasure and lovers of tranquillity, the strong and the feeble, the London lounger and the country cousin. As for the spectacle which the regulation theatrical audience presents in the older houses on ordinary nights, it would be as impossible to detail any novel feature as to discover some theory, hitherto unbroached, of the madness of Hamlet, or some excellences, as yet ignored, in the poetry of Pope. What they were in the days of the Rejected Addresses, that they are now, due allowance being made for difference in costume and the advance of social civilisation generally. Perhaps we have become more genteel than we were; perhaps theatrical audiences generally are less demonstrative and impressionable. It may be that the British public devotes itself with less abandonment, less surrender of its whole moral and intellectual being, to the entertainment provided on the stage. But that the popularity of the theatre has not diminished, we know from the records of managers and comparison of figures. Theatres are more numerous; theatrical audiences more representative, not only because the population has grown, but because with the growth of population there has been developed a new taste for theatrical entertainment, while the prejudices and scruples have been swept away. Modern taste is curiously compounded of a liking for extremes and opposites. It is elaborate, and it is plain. It finds pleasure in the most complex of forms, as of costumes; and yet is delighted with what, at least, wears the appearance of simplicity. Are not broad beans and bacon a fashionable dish at great dinner-parties? Is it not only two years ago that the melodies produced by musical-glasses — slightly disguised in character — were the rage in society? Do not full-grown men and women puzzle themselves with the riddles, and revel in the pastime erewhile confined to the nursery and school-room? A penchant for the juvenile is in vogue with modern society. Surely this was never displayed more conspicuously than in the favour with which a stage-performance of children, already noticed in this Journal, was received during the past winter months. The theatre-goer who makes it his duty to meditate on the sights of the auditorium, as well as the spectacles on the stage, never could have enjoyed a more fertile field for his observation than the Royal Adelphi, when the Children’s Pantomime was in course of representation. There were children by scores amongst the audience; but there were grown-up people as well, and, strange to say, it was the latter — the papas and mammas — who seemed to relish the thing the most heartily. As for the boys and girls, they gazed, indeed, intently upon what they beheld. The Lilliputian actors and actresses were to them as fairy children; it was difficult for the youngest of the audience, as they looked at the members of the juvenile company, to realise that little Goody Twoshoes and Boy Blue were made of the same mortal clay as themselves. Others, again, there were, or, let us use the present tense, and — fancying the whole scene before us — say are, who have just arrived at that age which affects superiority to whatever is purely childish. To laugh at the doings of the urchin-artists is beneath them; and so they sit as still as they can, while some may assume an approach to contemptuous condescension, leaving all the laughter to their elders, who, to speak the truth, discharge the task heartily. But it is not mere unreflecting amusement which, to judge from the expression on the rows of faces, possesses the adult audience. There are looks which tell of anxious, almost maternal, interest in the doings of the wee players. There is the young mother, with her chicks about her, who, as she directs her gaze towards the stage, seems to be looking wistfully into a more distant perspective. Is there not something of sadness visible in those soft, clear brown eyes? Is it an inevitable maternal impulse, or only an odd speculative instinct, which makes her ponder for a moment on what the dim, concealed future may have in store for those children on the stage; and, while she thus questions herself, press more closely the wondering little one at her side? Contrast with such a sympathetic critic as this those gentlemen and ladies of the audience who look on with an air of unconcerned surprise. “Curious little mortals; they really do it very well,” is a phrase that drops from the lips of these. Others, again, regard the whole thing with eyes of puzzled interest; and others — they are the oldest of all there — are, to judge from their faces, the amused recipients of anew sensation. Young men, too, there are, and young girls, recently “come out,” in the audience, whose countenances, whether eloquent of supercilious patronage or tender solicitude, are not less a book wherein we may read instructive things. The scene is changed, and we have transported ourselves to a different quarter of the town. It is only a few nights ago that we took a cab from St. James’s, and were conveyed to the transpontine Surrey. It was an enthusiastic, nay, a noisy audience which crowded Mr. Holland’s theatre from floor to roof; but it was well-behaved, most cordial, and sincere, if most vehement in the applause which it showered on its favourites. There was nothing specially instructive about it unless, indeed, it be its countenance of delight. There were visible social gradations in the audience. The two rows of stalls — the rest of the area was occupied by the pit — were filled by the elite of the vicinity of Kennington and a few pilgrims from the West End; the boxes were occupied, for the most part, by the magnates of local trade, and by young gentlemen who had evidently formed a party for the evening. It is somewhat late in the year to speak about pantomimes; but the Surrey pantomime, it may be said, in passing, was exceptionally good; and, as the audience was more than commonly demonstrative in its expression of good-will and encouragement, so did the actors, from the opening to the final scene, fling themselves with a heartiness into the fun of the parts which they were creating, that might have done the jaded critic of society real good. But to-night we have gone much farther afield than the Surrey Theatre. Is our cabman one of the exclusive Jehus who decline to ply east of Temple-bar? It is certain that he has deposited us at our destination only after much circuitous wandering, many enquiries as to direct routes, some doubt on our parts as to whether the goal proposed was practicable. How very few of those who live West know anything of that world which we have traversed in our drive due East — have any idea of the better and more attractive aspects of the most unfashionable quarter of London! True, we have threaded some stifling thoroughfares, where flaming gas-jets have lit up bulks on which malodorous fish are exposed for sale, and whose surface is covered with decaying vegetables and unsightly morsels; have seen many signs of misery and vice; much filth; much squalor; much of dirt, and rags, and drunkenness. But we have emerged from all this now. We find ourselves being whirled through broad streets, in which are bright, cleanly shops, full of cleanly, sober people, flanked by houses, unpicturesque, it may be, but substantial and healthy. The whole place is airy and light; there is much bustling about on the part of neatly-clad women, and children, and men; for it is Saturday night, and the week’s shopping is in progress. But a hundred yards farther to go — so one of the numerous guides whom we have been compelled to consult informs us — and we shall be there. Where is “there?” “Britannia, the Great Theatre, Hoxton,” where there is to be seen “an entirely new, magnificent, comic Christmas Pantomime,” by name “Turlututu;” and at the Britannia — sharply turning a corner and coming on a frontage brilliantly illuminated with gas — we arrive accordingly. There are few hangers-on about the door. A gentleman attached to the establishment, who is lounging on the steps with a colossal cigar in his mouth, informs us that there is not standing room in the house. But we have already engaged a box, and to it we are led by the most civil of attendants through long passages, their floors unlined by matting, and their brick walls covered only with paint. There is no effort at decoration, and for sanitary reasons it is as well that such should be the case. It is a peculiar smell that which assails the nostrils — a component odour, whose chief ingredients seem to be the perfume of disinfecting fluids and the fragrance of very coarse tobacco smoke. But what does the outside atmosphere matter? It is the inside sight which we have come to see, and that sight is not behind the footlights, but before it, consists not of the actors, but the audience. Imagine a vast semicircular structure, more capacious in appearance — though the result may be due to the absence of all trappings and other ornaments — than Drury-lane, packed with between five and six thousand men and women; not a vacant space on which the eye can rest, above, below, around; heads and bodies rising tier upon tier, till in the distance they dwindle to indistinct specks of humanity. Gallery, upper boxes, dress circle, pit — these comprise the divisions of the huge edifice; the box in which we are being the only one used this evening, at least, as private. The stage-boxes opposite are occupied by some dozen spectators, each paying two shillings a head, the price of admission to other parts of the house varies from one shilling to threepence. Next to the enormous multitude collected, the great feature which strikes us is the character and the demeanour of the crowd. The great proportion are working-men and women, clad in their working clothes; a few are mechanics and artisans, in broad cloth and dark tweed. As for the women, they are all neatly, but none showily attired. There is a fair sprinkling of children in arms. Some thirty per cent. of the entire audience are probably boys between the ages of twelve and sixteen. It is not a polished assemblage; the faces are for the most part grimy, and the hair unkempt, but the patient attention and tranquillity of the huge concourse are quite admirable. Nuts are cracked, Brobdingnagian sandwiches, as thick as bricks, and of much the same hue, are consumed, foaming pots of porter are quaffed. It is no polite show of light refreshments which is witnessed, but good, solid eating, and earnest drinking. Yet these do not prevent the audience from diligently noting all that is said and done on the stage. Nothing could be more orderly, nothing could be more decent. As for the entertainment itself, it is in character quite unexceptionable. There is no expression nor allusion, in dialogue or song, which can raise a blush; no phrase or sentiment which can shock the most susceptibly loyal of subjects. Surely, a mighty instrument for the harmless amusement of five thousand of the poor of London, in the heart of such a district as Hoxton, at an average of ninepence a head, such as the Britannia theatre, is a boon for which the moralist and philanthropist may well be grateful. Comments: The two main London theatres described here are the Surrey, in Lambeth, and the Britannia in Hoxton, a favourite haunt of Charles Dickens, who had founded the periodical All the Year Round. The earlier article to which this piece refers was George Augustus Sala’s ‘Down Whitechapel Way‘ [qv], Household Words, 1 November 1851, which includes a vivid description of a ‘penny gaff’ theatre. 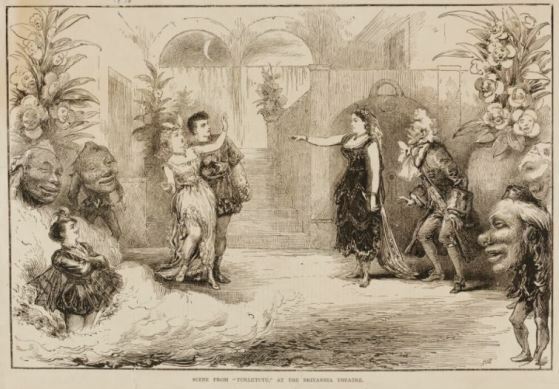 Turlututu was a fantastical pantomime, adapted from a French original by Frederick Marchant, which ran at the Britannia for over thirteen weeks 1876-77. Text: I was not more than twelve years old when I first entered a theatre. It was one of Robert Courtneidge’s Christmas pantomimes in Manchester, Robinson Crusoe, I think, with Vesta Tilley as the principal boy. I was not ‘taken’ to this pantomime; I went by myself and watched from the highest gallery in the world. After long waiting in a queue until you would hear the lifting of a bar at the door, you placed your six-pence under a wire-netting, from behind which the girl or woman in charge pressed a lever, and a heavy square deposit of lead came out of a slot. That was your ticket. The climb to the gallery was arduous, even to an eager boy. Round and round, with acute angles all the way; at every step upwards one’s body became more bent on the purpose, the knee action more deliberate, the breath more sternly drawn. Then, at the top of the steps was a dark refreshment bar (not yet opened) to pass through, and now at last the theatre itself was attained. At great distance below was the stage, the curtain alluringly down. To find a front place in the gallery involved some agility and nerve; there were no seats, only long rows of wooden ledges, and to save time and to get there first we did not walk gingerly down a central staircase but leaped from cliff to cliff. We would lean over the rail of the gallery and watch the stalls and pit assembling. Sometimes a programme fluttered down, like a visitant from another hemisphere. When I write that ‘we’ would lean over the gallery rail, I am using the ‘we’ metaphorically; for I went alone to the theatre in my boyhood, as indeed I went alone everywhere, walking through the city streets reading a boy’s paper and by some instinct always coming out of my enchantment just in time not to bump against a lamp-post. I do not know how I contrived to get money for admission to the theatre gallery week by week; on one occasion at least I committed petty theft. I stole a volume out of the limited and discursive family library, which comprised East Lynne, the Bible, somebody’s Dream Book, and one other novel, this by Marion Crawford. The volume I stole was a collection of poems by Coleridge, and I am at a loss to this day to understand how it came to find a place in the household. I took it to a second-hand bookseller’s in Oxford Street owned by a man of immeasurable age, who made me think of the Old Testament. His clothes were shiny and he smelt; his name was Coleman; and in his front window, amongst a ruin of ancient literature, was a phrenologist’s bust, the head marked into squares like the counties on a map. The interior of the shop was gloomy; piles of books, and the odour of damp and slow decay. There was another Coleman, reputed to be a son, with skin of vellum and eyes tightly stuck together by what my fearful imagination visualised as blindness. And I will show you all the joys of Fairyland. Opalescent deeps of the sea; caves of turquoise and rubies; apocalyptic sunrises and radiance of every boy’s dream of the Arabian Nights, all accumulating in a lavish expense of electricity. It was with an amount of relief that one witnessed at the apotheosis a temporary lowering of the fireproof curtain. As I say, I did not attend my pantomimes in the innocence of childhood; the fairy-tale basis of a pantomime had for me but a secondary interest. I marked the distinction between Robinson Crusoe and the principal boy who happened to be playing the part; I knew that Abanazar was Horace Mills, and once when I saw Horace Mills walking in a Manchester Street looking exactly like any man of business wearing gloves and a bowler hat, I followed secretly behind him and laughed to myself at his every movement though he did nothing that was the slightest bit funny off the stage. Ada Reeve was Aladdin one year; I remember that when she couldn’t remember the world ‘Abracadabra’, and she realised she was locked in the cave more or less for ever, she immediately consoled herself and the rest of us by singing ‘Good-bye, Dolly Gray’, the popular song of the Boer War. But the point is that she didn’t sing the chorus but spoke it, in a husky dramatic monotone. This was revolutionary; this was new method. The cognoscenti in the dress circle, I was informed years afterwards, were taken aback, and they shook their heads until by force of art Ada Reeve conquered a lifetime’s principles. Round about this time of my life I saw Ada Reeve in Floradora [sic] the very week after the last performance of the pantomime; and pantomime ran from Christmas to Easter; and now she was a fashionable society darling, in a big brimmed hat, and she sang a song called ‘Tact’ in front of a row of long-trousered top-hatted young men with silver-mounted walking sticks. One week Aladdin’s cave and the splendour of the Orient, but in a few evenings it had all gone. Now, living and moving and having being on the same boards, walking in the same places where Widow Twankey and Abanazar had shaken the theatre into reckless and eternal laughter, were elegance and romance in a setting of tea-planters or what not; palm trees and deodar, and the melodies of Leslie Stuart. The palimpsest of the stage! I didn’t know of such a word but I remember a sudden feeling of sadness coming to my eyes when, once at a pantomime somebody sang ‘Is your Mammy always with you?’ and as I looked at the singer’s movements in the round circles of limelight that followed her, throwing two dancing shadows, the thought came to my mind that some day somebody else would perhaps be dancing on the same spot, and all would have become different; all would then be new and this would be forgotten long ago. But soon I’ll have this Crusoe in my grip. These lines were invariably pronounced at the beginning of Act I in Davy Jones’s Locker, which was a drop-scene calling for merely what Mrs Gamp would have called a ‘parapidge’ of stage. The Demon King was a baritone, and the chances might be that we had last heard him on the pier in August at Southend singing the ‘Bedouin Love Song’ with the pierrots. Now in a more dramatic environment under the sea and in the dark he probably struck a deeper and more ambitious vocal note; ‘Rage thou angry storm’ from Balfe was not beyond the dream of possibility. From the murky element of the Storm King we would be changed in the twinkling of an eye to Pekin (maybe); or if the pantomime were of the occident the scene would be the village green outside the ‘Bull and Bush’. It was in Scene 2 that the pantomime really began and the stalls filled up. The Storm King didn’t appear again for hours, or the Fairy Queen. I often wondered what they were doing all the time. In Scene 2 the important personages of the pantomime made their appearance in order of renown. The Baron (or the Emperor) was allowed to hold the centre of the stage for a few minutes; perhaps he was even given a song, but nobody listened to him; he was merely a part of the connived plot of suspense. First came the principal girl – Amy Augarde or even Gertie Millar; then the more substantial principal boy (the best of all was Ada Blanche); and the principal boy would dash down the footlights and embrace the principal girl, kicking his left leg backwards as he did so. At last, when the ‘House Full’ boards were put up in the theatre’s main entrances – terrible to see if you were outside in the fog trying to catch a glimpse of something behind the brilliant lights of the foyer – now was the moment: the stage was left significantly vacant for a brief pause. From the wings came sounds of brawl and derision and racket. And the Dame would arrive in some state of dishevelment, out of breath, having, for some reason never explained, been chased. Dan Leno or Robey or Harry Randall or Wilkie Bard – it might be any of them! – in elastic-sided boots, hair parted straight down the middle and tied in a bun, towards which the right hand would absent-mindedly stray when she came down the stage and spoke to us intimately about ‘Her First’ and of the vicissitudes of matrimony. An incomparable school of great English comic-actors created a Dickensian gallery of Dames. The greatest of them was Robey’s ‘Mother Goose’, who swerved from the unities of pantomime in her entrance to that most matchless of all pantomimes at the Manchester Theatre Royal, Christmas, 1904; and I saw it many times before it vanished into air the following March. Satisfaction and triumph here became evident in Robey’s eyes and gestures; but suddenly he stiffened, and the neck was thrust again towards Mrs Moggeridge’s garden wall, whence obviously some Parthian thrust had been aimed. ‘And what of it?’ asked Robey, the voice rising in mingled menace, disdain and clear conscience. ‘What of if?’ (pronounced ’What arvert’). Speculation sought in vain to deduce the nature of Mrs Moggeridge’s innuendo that it should have compelled this final bridling and this unanswerable fiat. Enough to say that after the pronouncement of it Mrs Moggeridge was heard no more. It is hard to believe we did not actually hear her or see her; there wasn’t never indeed ‘no sich a person’; it was a conjuration of comic art. Robey was a master of tantrums, or in other circumstances, of spasms. In Jack and the Beanstalk, when Jack returned home with beans for the sale of the cow, Robey as the Dame achieved an awe-inspiring expression of twitching incredulity, woe and mortification, all evenly blended. He (or she) hurled the beans through the window, and at once the stalk began to grow upward. Robey caught sight of it out of the corner of his eyes as he was suffering another wave of distress. And he began to giggle, to experience hysteria but no words can describe this masterpiece of comic acting. It was done by imaginative absorption into a character and a scene; and here is the difference between the old great pantomime comedians of my youth and the comedians of to-day, who get their laughs by the things they say and are not funny in themselves, and are certainly not actors. Robey and Leno and Wilkie Bard and Little Tich and Harry Weldon were most nights in the year performers in the music hall, red-nosed and holding an audience for three-quarters of an hour, holding the theatre single-handed, with song and patter; and from time to time they would leave the stage to return as a new character – Robey’s Lord Mayor of Muckemdyke, Leno’s pathetic little Cockney just married, the victim of a building society; he had bought a house, and he leant over the footlights to tell us in husky confidence of his pride of possession. It was a nice house, with the river at the bottom of the garden; that is, when the garden wasn’t at the bottom of the river. But I must use a platitude now; it was not what these old drolls said, it was the way they said it. Little Tich, breathing on his tall hat before giving it a rub round with his elbow, made a noise that emptied his lungs, fraught with bronchitis. Gusto and faith in a complete surrender to extravagance; no smart-cracks but natural nonsense – as when the Ugly Sisters in Cinderella, having been refused admission at the ball, Tom Foy said to Malcolm Scott, ‘Let’s walk in backwards and they’ll think we’re coming out.’ It was these comedians of the music hall who peopled our memories of pantomime with a gallery of Dames, each as rich in identity as Betsy Prig and Mrs Camp and the nurse in Romeo and Juliet. The convention of pantomime persisted that the Dame and her son should begin poor and end wealthy. All the good characters, in fact, shared ample fortune as a reward of virtue; and during the last scene they came before us most opulently garbed – Robey’s magnificence was like a fantastic dream or apotheosis of a riotously lunatic Schiaparelli. The lesser male luminaries of the show, Idle Jack or Sinbad the Tailor, would wear terrific check suits with huge buttons of gold, and their choice in walking sticks was rococo. Nobody was harshly treated in this last of all the pantomime’s consummations of glory and electricity; even the Demon King received a burst of applause when he appeared, apparently a reformed character, in morning-coat and grey topper. And the children crowed their delight as the Cat came on for his share of the general recognition and acclamation, wearing a fur coat most likely. Then the final chorus and the last ruthless descent of the curtain. Nothing left but the return to the world, to find oneself again in the streets outside, where life had been going on just the same on a winter day; it was dark now, with the gas-lamps burning, and when we had entered in realms of gold it had been afternoon and broad daylight. Comments: Neville Cardus (1888-1975) was a British cricket correspondent and music critic. His impoverished childhood was spent in Manchester. Robert Courtneidge was a theatre producer, actor and playwright, and manager at this time of the Prince’s Theatre in Manchester. The production of Robinson Crusoe Cardus recalls was probably that of 1902/03 (it did not star Vesta Tilley). The Aladdin that he saw opened at the Prince’s Theatre on 22 December 1900, with Ada Reeve, G.P. Huntley and Horace Mills. The 1899 musical comedy Florodora was written by Owen Hall, with music by Leslie Stuart.The production of Mother Goose at the Theatre Royal opened in December 1904, starring George Robey, one of the great figures of English music hall and variety. Text: Q. Did you go to any kind of show? A. Yes. What we used to do about the circuses, you see, everybody could see a bit of the circus because they used to have a gigantic procession that went through the main streets and of course, everybody who could – this was held about … sort of between the school hours, so of course, everybody who could would go up and see it. Because, of course, there’d be everything. There’d be elephants and … ‘course, that wasn’t on the scale of Bertram Mills what is now, not on that scale, not the kind of circus that used to come to these towns. But there used to be another one, Lord John Sangers, that was a big circus. ‘Course, they generally only had one day and ‘course, they were great events. They were great events. And of course, you see, they had their own band and they would be on these gaily decorated cars going through the town; and then there’d be all the costumes and all the animals. Oh, of course, that used to be a great, a wonderful sight. But as I say, I never went. But we didn’t get many entertainments because, for one thing we couldn’t afford it, because people couldn’t, not children. Children didn’t have the pocket money and not only that, even in Colchester the entertainment children would have gone to didn’t exist. There were no pictures; the theatre, it was sort of too much up, too much up for children, you know what I mean. The theatre, it wasn’t … plays, the children wouldn’t have been able to understand the ordinary plays, unless you had a pantomime at Christmas, that was the only thing. But otherwise, I mean, plays were too … they weren’t suitable. Well, they weren’t considered suitable for children and children wouldn’t have enjoyed them. There used to be a variety theatre here at the Hippodrome, what’s a bingo club now. That was the first variety theatre opened and we did used to go to that sometimes, because, of course, you could go up in the gallery for about 3d. Q. Do you remember anything you saw there? A. Oh, yes. Oh, there used to be some very fine shows, of course. ‘Course, up in the gallery you didn’t have an upholstered seat to sit on, you just sat on the boards. But then, of course, if you could afford to go down in the pita you got a better seat. But of course, they used to have some very fine shows, I mean, because some of the principal comedians used to get here, you see. And I can always remember one special thing about one of them. There was a doctor on one occasion – well, he was a so-called doctor (although if he was a real doctor I don’t know what he was doing playing … (laughter)) – but anyway, he claimed to be able to cure people. And there was a boy at school, a boy at the school I went to, he was a cripple and of course his people, like everybody else they were poor. And the teacher was so sorry for him and she paid for him to go to this … just to see if this doctor could do him any good. And of course, he went up on the stage – you see, people used go up on the stage and I don’t know what this doctor used to do, but … ‘course, it didn’t make the slightest different to this boy. It didn’t make the slightest difference to him, I mean, he was just the same afterwards. And of course, these doctors would only be here a week, nobody saw them after that, so the fact that he hadn’t cured you didn’t cause a lot of bother because he just wasn’t there. But that was one thing. But of course, they did used to get some jolly fine shows. You’d get people riding one wheel bicycles and all sort of things. Of course, our trouble was that while we went to school we just hadn’t got the money, we couldn’t go very often. Comments: Edward William Wifen (1887-?) was the youngest of eight children (two of whom died before he was born) of a Colchester gardener. His recollections must date from the 1890s or early 1900s (the Colchester Hippodrome was built in 1905, but he would not have been at school by that date). Lord George Sanger (1825-1911) was an English showman, who put on public entertainments, including touring circuses, with his brother John Sanger (1816-1889). The business partnership was dissolved in 1884, with each brother managing their own show. After 1889 John Danger’s business was carried on by his son. Wifen was one of 444 people interviewed by Paul Thompson and his team as part of a study of the Edwardian era which resulted in Thompson’s book The Edwardians: The Remaking of British Society (London: Weidenfeld and Nicolson, 1975). Text: My guess is that, since our family finances had worsened greatly over the previous two years, going frequently to the Kabuki was a luxury we could no longer afford. 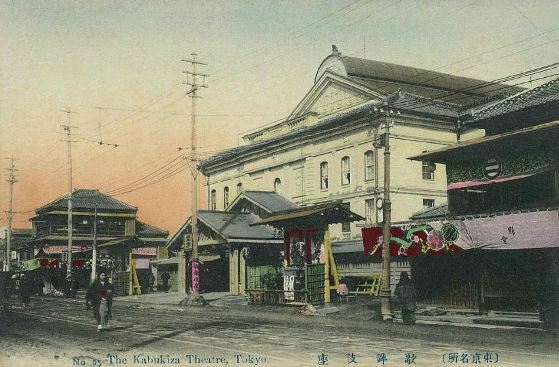 According to the Yearbook the admission fees at the Kabukiza in those days were four yen fifty sen for a first-class box, three yen fifty for a good raised box in the orchestra, two yen fifty for an ordinary box in the orchestra, thirty-five sen per person for seats in a second-class box, and twenty sen per person for seats in the boxes on the third tier. And though Mother still seemed to go from time to time at my uncle’s invitation, I was now included in these parties less and less often; presumably, as I got older and bigger, it became a nuisance to try to find space for me in one of the good raised boxes that we always rented. I can still remember how it felt to go with Mother by rickshaw from Minami Kayaba-cho toward Tsukiji, where the Kabukiza was, my heart beating fast with excitement as we raced along. Mother still referred to Shintomi-cho, which in the 1870s had housed a licensed quarter called the ‘New Shimabara,’ by that name; and so, crossing Sakurabashi bridge, we passed through ‘Shimabara,’ where the Shintomi Theater now stood, turned south along the bank of the river just in front of Tsukiji bridge, and, approaching Kameibashi bridge, caught our first glimpse of the large, cylindrical section crowning the roof of the Kabukiza. The theater had been built in 1889, so it was only four or five years old at the time. Nearby were some eleven teahouses affiliated with the theater, and these displayed bright flowered hangings on their second floors whenever the Kabukiza was open. We always left our rickshaw at an establishment called Kikuoka and then, with hardly a moment to rest in the guest room, we were hustled off by the maids. Slipping into the ‘lucky’ rush sandals supplied by the teahouse, we crossed a wooden-floored corridor and entered the theater. I remember how, after we had slipped off our sandals and stepped up into the theater corridor, the smoothly polished wooden floors felt strangely cool even through the thick soles of my tabi socks. Generally one felt a kind of chill in the air as one came in, with a breath of wind as cool as mint entering from the sleeves and from below one’s holiday kimono and prickling the underarms and nape of the neck. The slight sensation of chilliness was like the fresh, bright days of plum-blossom viewing in very early spring, making one shiver pleasantly. ‘The curtain’s going up!’ Mother would call, and I would hurry so as not to be late, running down the cool corridors. I remember that often as we returned from the play it was raining. Perhaps this made our visit to the theater all the more memorable for me. The rickshaw in which we rode was fitted out with an oilcloth awning – the same material as those table covers used in Chinese restaurants. The odors of the oilcloth and the oil in my mother’s hair blended with the sweet fragrance of her kimono, filling the darkened cab. As I took in these smells and listened to the sound of the rain beating upon the awning, the images of the various actors we had seen on stage that day, the sounds of their voices, and the stage music came alive again for me there in that dark, enclosed world. On nights when I had watched scenes of a woman about the same age as my mother having to part with a beloved child, or stabbed by a furious husband, or driven to kill herself for the sake of fidelity or chastity, I asked myself what Mother would do if she found herself in such straits. Would she too abandon me or let me be killed for some principle? Thinking such thoughts, I passed along the streets that led toward home, swaying with the motion of the rickshaw. Comments: Jun’ichirō Tanizaki (1886-1965) was a major Japanese novelist, author of Tade kuu mushi (Some Prefer Nettles), Yoshinokuzu (Arrowroot), Sasameyuki (The Makioka Sisters) and translations of The Tale of Genji. His childhood memoirs includes many references to theatrical entertainments in Tokyo, in particular visits to the Kabuki-za.